Erskine Bowles and Alan Simpson, who chair the “moment of truth project”, released yesterday their latest proposal to rein in the federal debt. It’s a four step program, counting as the first two steps the Budget Control Act of 2011 and the American Taxpayer Relief Act that was signed into law last month. While pretty vague about the details, they put dollar figures to the deficit savings from each step. So step 3 would reduce deficits by $2.4 trillion over 10 years, but not counting scheduled reductions in war spending it would reduce deficits by $1.9 trillion relative to current law. About $600 billion of this money would come from tax increases and the rest from spending cuts. Step 4 would basically raise gas taxes to match transportation spending, which is not a bad idea. Reform the Tax Code in a Progressive and Pro-Growth Manner. The current tax code is complicated, confusing, costly, anti-growth, anti-competitive, unfair, and riddled with well over $1 trillion of tax expenditures – which really are just spending by another name. Tax reform must reduce the size and number of tax expenditures to reduce the budget deficit and lower marginal tax rates for individuals and corporations. At the same time, tax reforms must maintain or improve the progressivity in the tax code and promote economic growth. Tax reform will make the tax code more efficient, effective, and globally competitive. Certainly, the tax code needs to be cleaned up and marginal rates need to come down, as we have argued consistently. But it is folly to pretend we can both “maintain or improve the progressivity in the tax code” and “promote economic growth.” It was already the case prior to the fiscal cliff deal that the U.S. had the most progressive income tax system in the developed world, according to the OECD, meaning the rich in the U.S. pay a higher share of the tax burden than in countries like Sweden and France. The fiscal cliff deal raised taxes on high income earners, so we have now beaten our own record. Sounds great, except the OECD also finds there is a “non-trivial tradeoff between tax policies that enhance GDP per-capita and equity.” This means shifting the tax burden to the rich, in an attempt to achieve more “equity”, inevitably reduces the incentives for the rich to invest, work hard, take risk, and hire. So as it turns out, the rich do something productive for society, so we can’t continue to raise taxes on them and expect no downside. The preponderance of evidence supports this common sense notion. 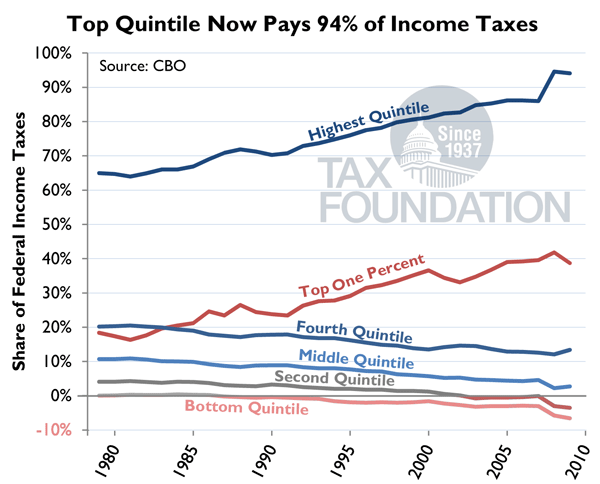 The chart below from CBO data shows the steady increase in progressivity over the last three decades, such that 94 percent of the federal tax burden is now paid by the top 20 percent of households. This is likely a contributing factor in the slowdown in economic growth over the same period.